For a leader clinging on to power can be the most logical thing to do. But the ones with the strength of character and the self-confidence know when to step aside. Not that this is ever easy. Executives stay in their positions long after it is evident they are ineffective, often taking their organizations down with them in the end. Now take that situation to an institution steeped in a culture that has remained largely unchanged over centuries with the tacit understanding that the leaders role is for life. In fact Pope John XXIII, when asked what is it that depressed him most about being the pontiff, quipped, “It is going to sleep every night in the bed you know you will die in.” Leader of over a billion Catholics and considered infallible, the title of a Pope is not worn lightly. Yesterday Pope (now Emeritus) Benedict XVI started a new life as a ‘Simple Pilgrim’ after stepping down from his position. I can scarcely imagine the difficulty he would had when taking this unprecedented decision (the last one was over 600 years ago) knowing the ripples this would send through the world. But in the end history might show that this act might be the one that saved the now troubled church with its staunch refusal to be more open in sensitive matters. Only time will tell. For now this is the most profound act of self sacrifice I have seen from a religious leader. Shortly after 8pm the doors of the Castel Gandolfo were closed. The resignation of the Pope was in effect. The Swiss Guards marched away indicating that the Pope was no longer in residence. 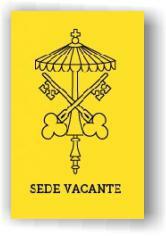 And in a sign of changing times, the official twitter handle of the Pope changed its status to Sede Vacante (The Holy See is Vacant). And sometimes they don’t see it coming, but still salvage their position it with a sincere ‘I am sorry I screwed up’ note. Its true its the most difficult thing to do. Its like leaving your loved , cherished one to be taken care by a whole bunch of “other ” people who may or may not understand the passion with which you brought it up. And more than the act of giving up, it is when to give up the most difficult thing, if you give up too early or too late, you would have sabotaged the benefits anyways.